I’ve been studying with the Open University now for six years; the first three years studying at undergraduate level, and the past three years at postgraduate level. 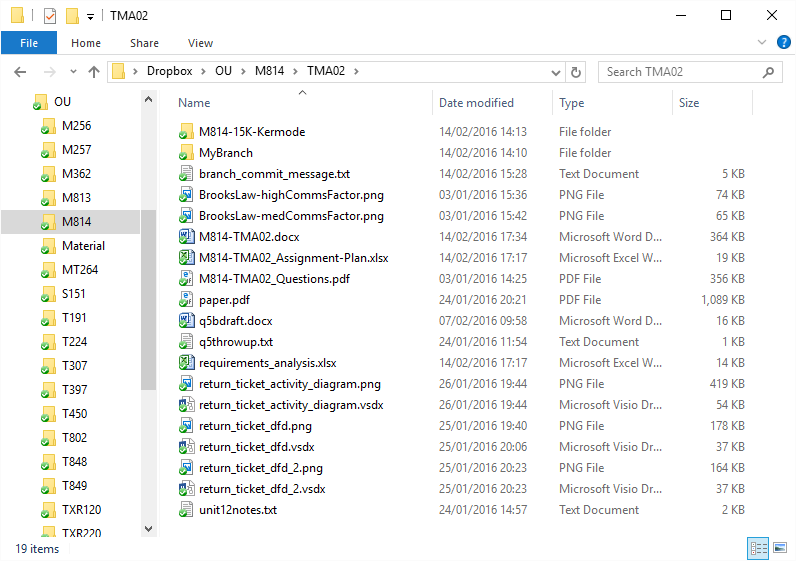 Over this time I have developed what I feel is quite a nice system for tackling the Tutor Marked Assignments (TMAs) that OU students regularly complete, so I thought that documenting this process could be helpful to others who are new to distance learning or still thinking about starting the journey. For my first ever TMA (back in 2009) I started by creating a generic document template using Word. I gave it a front page containing the module title and code, my name and personal identifier (PI), and the date that the assignment was last saved. I used page footers so that my name, PI, and the page number are at the bottom of each page. I have used this basic template for every TMA and End of Module Assessment (EMA) since. Current count is 40 TMAs and 7 EMAs! Tip 1: Check the assessment guide for your specific module to make sure you have included the correct information. Tip 2: Remember this is a creative process. You can make the template look however you wish. You don’t need to copy someone else! I’m sure there is a quote somewhere that relates having a messy work area with having a messy mind. Personally I find this to be true, and having a nice logical directory structure means that I don’t have to waste time panicking over where I put “that important paper that I read four months ago”. When I attended a bricks and mortar college it was handy to keep all of my coursework on a USB storage drive. That was until the drive died and I lost all of my work. So now I use a combination of Dropbox and OneDrive to keep all of my important work backed up online and accessible across all of my devices. Whatever tech ecosystem you’re using (Apple, Android etc. ), you will have a similar service available. I highly recommend making use of it. Tip 3: OU TMAs can be viewed online as a single webpage. I print this page to a PDF file and put it in my study folder so I can access it without having to log in to the website. Be careful though, there have been occasions when the “live” version on the website has changed after I took a copy. I love to have visibility of a project because it helps me to sleep at night (most of the time). As an engineer my tool of choice for this is typically a Gantt chart, although there are many other popular methods you can read about online. You don’t need any fancy or expensive software to do this; I just use a spreadsheet as in the example below. I use them for everything: my overall degree progress, planning individual assignments, revising for exams, even when planning DIY jobs around the house. I’ll now describe the seven main stages that I use for planning and developing my TMAs. There is nothing worse than staring at a blank page! When you need to start a TMA, don’t procrastinate, just take your generic TMA template and start customising it for the assignment at hand. Start with the module title, assignment number and date. When the basic structure is set up I start to bring over the questions themselves. I find that it helps to rewrite the question in my own words as this forces me to really read it rather than just skimming it. Using [the framework covered in Block 2], assess the extent to which it applies to your chosen organisation. There may be no exact match, of course, in which case you need to explain and justify why you draw such a conclusion. So there are 45 marks available here, spread across 800 words. This suggests that we should be writing roughly 17 words per mark (800 words / 45 marks, rounded down). I love data. I’ll show you why. During several of my past assignments I collected data on how many points I could make in a given word count, the number of paragraphs this consumed, and how long it took. When I say “points” here, I mean points within the argument (not to be confused with the marks available). These points could be references to a particular concept or topic from the module material, or maybe a point based on my own experience of the subject. So I now know, on average, how many topics I can cover for a given word count, how many paragraphs this will consume, and roughly how long it will take me. I have used this knowledge to create a simple estimation spreadsheet. I plumb in the number of words required for a question, and out pop the relevant stats. Bear in mind that this is a guideline only, albeit a very useful one. Also bear in mind that the data will vary for each student, and between different types of module. As with all types of estimation, you should continually check how accurate your estimations are and correct the process if necessary. Once I know roughly how many points I need to make in an answer, I then create a list of candidate things to talk about (i.e. a skeleton answer). I find that I don’t need to be sitting at my laptop to do this; inspiration for the logical structure usually hits me when my mind is on other things (e.g. sleeping, in the shower, or driving). So be prepared to quickly write down the list wherever you are. It is important to cover enough concepts from the module material to demonstrate that you have actually read it (and thought about it), but don’t fall into the trap of thinking that you have to cover everything that you have read. Also don’t feel that your list has to have exactly the same number of points / topics that were estimated earlier. Remember it’s all just a guide at this point, I never know exactly how deep I will go on each topic before I actually start writing. This is an example of skeleton that I created for a critical evaluation of an academic paper. The final draft came in at just over 500 words. Often I will put the skeleton aside for a few days and let my subconscious work on the TMA for me. Again, the inspiration from this process can hit you at any time, so be prepared to capture it. At this point I use what I call a throw-up (some people call it a brain dump). This involves letting my thoughts flow through my fingers onto the keyboard, fleshing out the bones of the skeleton. The aim is to get the full flow of thought out quickly without analysing. Don’t stop to reword sentences or correct typos, you will lose the flow. For this reason I just use plain old Microsoft Notepad because it comes with no distractions. To create what I consider to be the first draft I copy the throw-up into a word processor, chop it up, change some parts around, and do minor rework of others. At this point you can get a good feel for whether you are on the right track. It’s pretty obvious if some sections (or the entire document) have not met the suggested word count. I will also make sure that all points in the questions have been answered and that all references have been cited correctly. 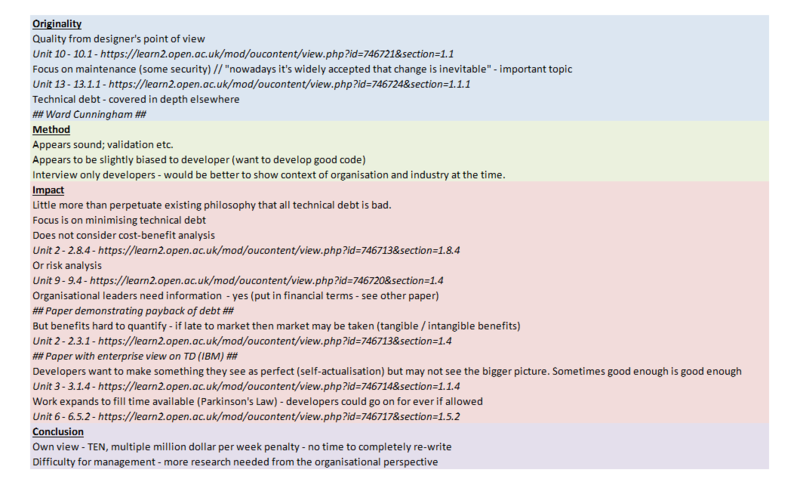 It now becomes an iterative process of tidying up the document so that it reads as a coherent piece. We wouldn’t typically read an academic paper for fun; often they are far too dry. There have been rare occasions however where an author has brought some personality and flair into the writing, for example relating the subject at hand to wider world events and historical context. After several years of being an OU student I’m only just reaching the point where I am confident enough to try to start emulating this myself. It’s definitely a tricky balance to achieve, but this wouldn’t be a very useful learning process if it was easy now would it ☺. Thank you for sharing your experience and insight in to the OU TMA. 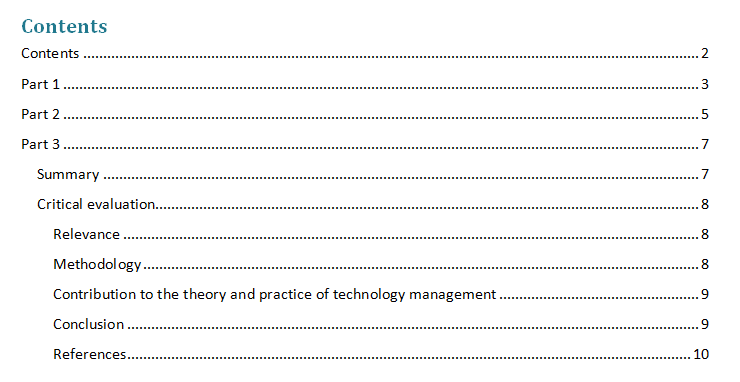 I am just starting my first course with the OU (T848 incidentally, which I can see you studied). This has been very helpful. There’s no better way to learn than do – I await the first TMA! I would have found it very tough going straight into postgraduate study! T848 was a really nice module though, especially the mini project for the EMA. Hope it’s all going well for you. David, this is absolutely brilliant. I love the strategic essay planning using formulae; I’m a numbers gal (ha!) so may attempt something similar in the future. Thank you for sharing all of this knowledge you’ve gained over the years. Hi Kelly, happy to give you some inspiration. This is just the method that I’ve come up with, I’m sure you can find some great techniques of your own. Enjoy your studies!